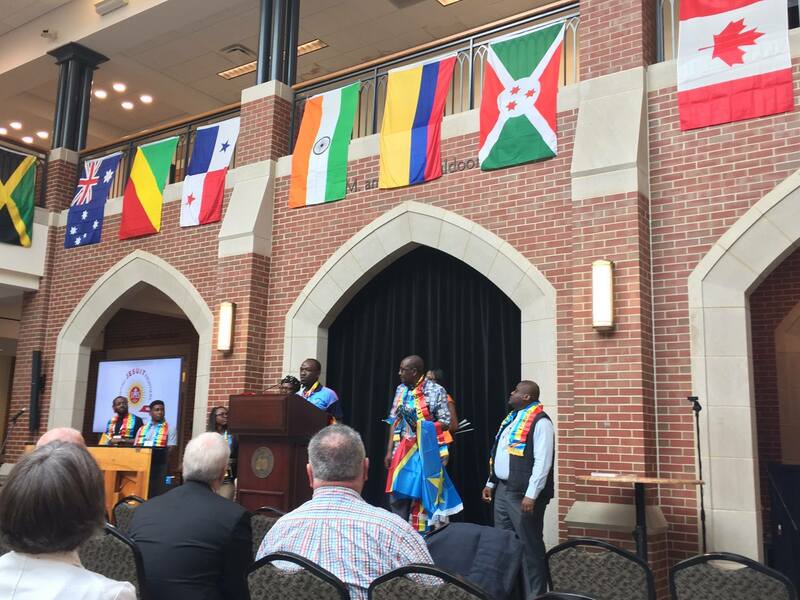 Fr Howard Grey, former Vice President of Mission and Ministry welcomed participants to the conference at John Carroll University in Cleveland, Ohio. 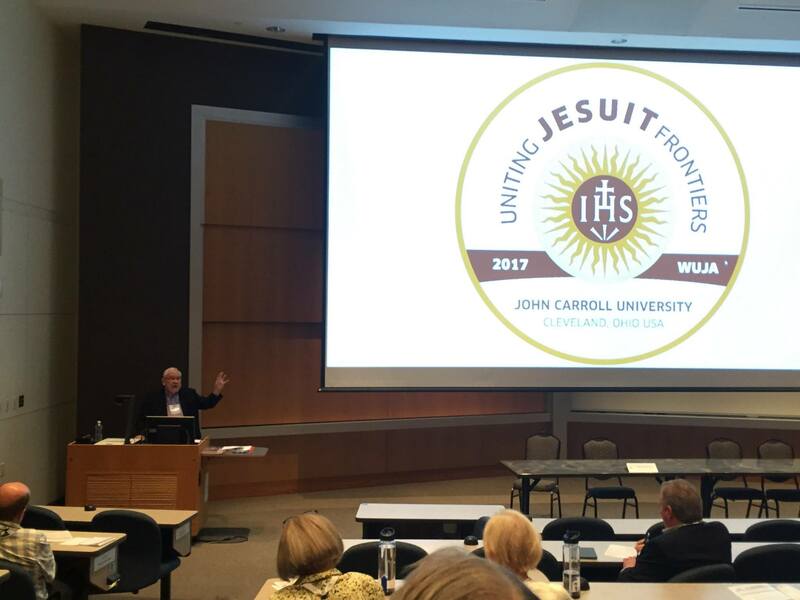 Kevin Sullivan (SFS ‘14) attended the 2017 World Union of Jesuit Alumni Congress (WUJA) this past summer. With the school-year underway, his account of the conference reminds us – as members of a Jesuit institution – of our purpose and what it means to stand with others. The WUJA, hosted at John Carroll University in Cleveland, Ohio, was the first held in the United States. It assembled approximately 450 representatives from a vast network of Jesuit alumni and educational ministries, and re-committed us to our mission and vision with featured talks and discussions with some of the leaders in Jesuit education and ministry. One such presenter was, Fr. Greg Boyle, SJ, author of Tattoos on the Heart. Boyle shared the story of Homeboy Industries – a social enterprise organization based in Los Angeles that provides hope and opportunity for those seeking to leave gang life. He said Homeboy grew to be the organization it is because it was allowed to grow organically. Rather than trying to play an authoritative role, doling out prescriptive solutions, the Homeboy community stood with the area’s poor and marginalized; supporting them in their efforts to create their own opportunities. “The Homeboy example illustrates the Ignatian call to service in action,” said Sullivan. “It­­­­­­’s about standing at the margins with the vulnerable, and allowing responses to their challenges emerge from their own context.” It is not about fixing other people’s problems with technocratic solutions intended on saving them. It’s about providing opportunities to that people may grow and realize their own potential, he added. The Congress also featured an update on the Society of Jesus from Fr. Tim Kesicki, SJ, president of the Jesuit Conference of Canada and the United States, who noted that the Jesuit presence is shifting rapidly to Africa and Southeast Asia. Other examples of service in these regions, as well as Central America, Jordan and Afghanistan, include the work of Jesuit Worldwide Learning (JWL). Fr. Peter Balleis, SJ, president of JWL, recounted his organization’s efforts to provide an online Jesuit education to young people in refugee camps as a way to serve the most vulnerable. The Congress had the express mission of cultivating collaboration and networking for good. More than 30 countries were represented, including Lithuania, Ireland and a large contingent from the Democratic Republic of the Congo who celebrated their nation’s Independence Day with us. Representatives from the Democratic Republic of Congo celebrated their Independence Day at the conference on June 30th. Attending the WUJA Congress was a stirring reminder for me that my pride in being a Georgetown alumnus extends so much farther than the Hilltop, and that the call to connect and serve alongside Jesuit alumni around the world is an exciting and life-giving invitation that we can all partake in. Thank you to Georgetown’s Campus Ministry for encouraging me to attend and to represent our small, but important corner of the Jesuit alumni world. Kevin Sullivan is the projects manager for the Initiative on Catholic Social Thought and Public Life at Georgetown University.